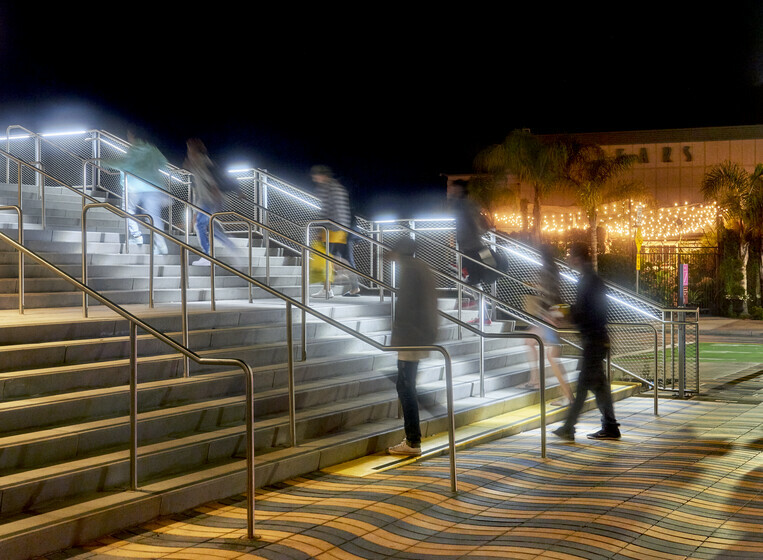 Through efficient lighting design, environmental analysis, and design recommendations, Atelier Ten defined the Santa Monica Colorado Esplanade as an inviting, pedestrian-friendly connection between the Metro Expo station and famed Santa Monica Pier. 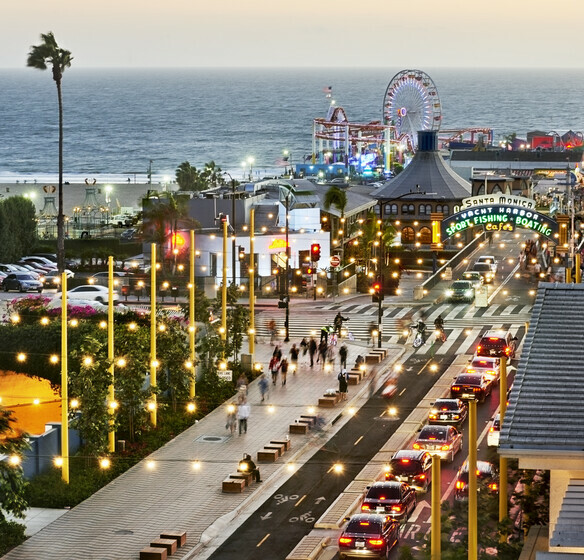 The Esplanade is one of the most utilized stretches of public space within the city of Santa Monica, making it an ideal location to highlight the city’s commitment to environmental responsibility. Atelier Ten worked closely with PWP Landscape to identify environmental strategies for the project in the early stages, which support the goals outlined in Santa Monica’s Sustainable City Plan. 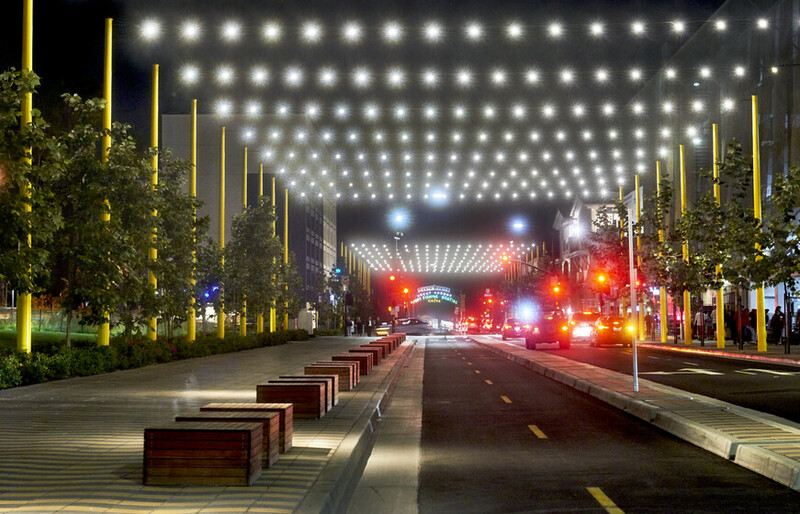 Likewise, Atelier Ten’s lighting design approach supported both the sustainability goals and the desire to create a fun, inviting outdoor environment for pedestrians, cyclists, and passengers debarking from the newly opened light rail. 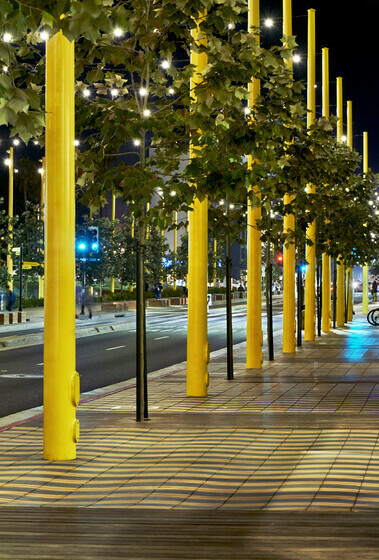 Drawing inspiration from fairgrounds and carnivals, strands of catenary luminaires extend the festiveness of the pier along the esplanade and create a sense of place and arrival. 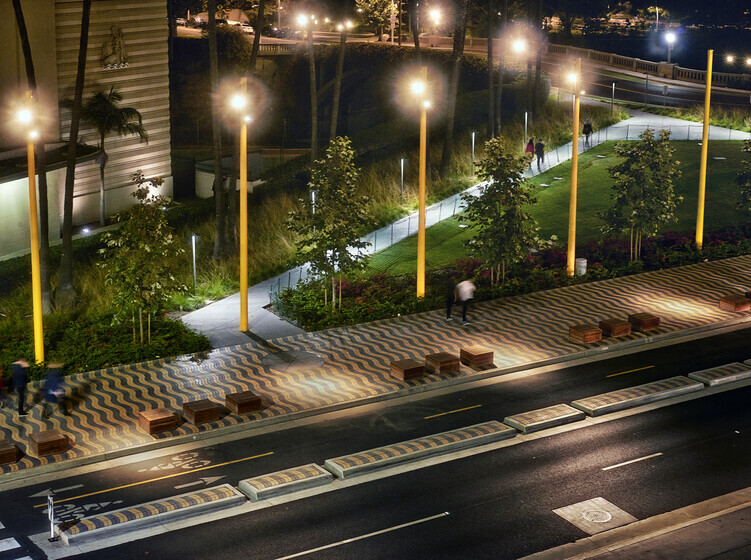 The lighting design was developed in close coordination with PWP Landscape, the civil and structural engineers, and city officials. 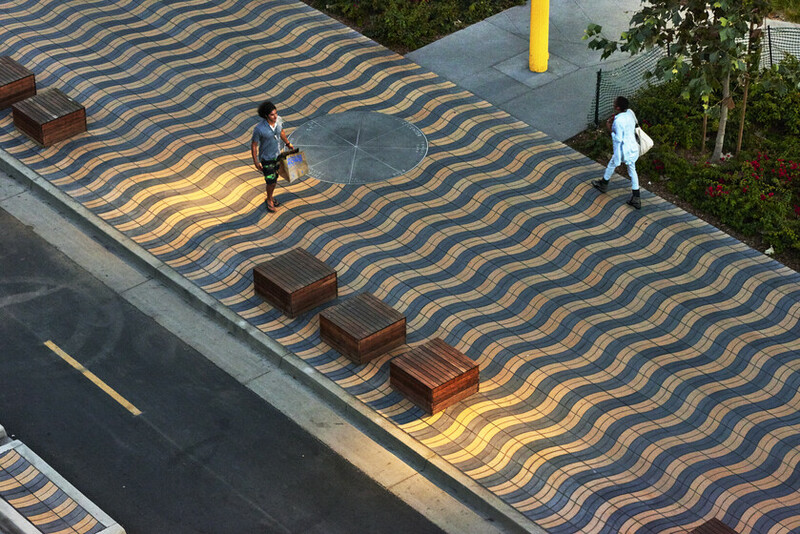 Pole locations and color correlate with the rhythms of trees, benches, and wavy paving patterns within the existing street grid to emphasize the desired sense of energy and movement along the esplanade. The durable, aluminum powder-coated luminaires use long-life LED retrofit lamps for energy and maintenance cost savings, consuming only 0.068 watts per square foot. The 36 foot poles help to avoid vandalism and to facilitate emergency vehicle access. The careful detailing for the tension-mounting of the light strands enables critical tautness of the 67 foot lines spanning the roadway.